A nuisance ex who continued to pester his former partner after he had been made subject to a domestic violence protection order has been fined. 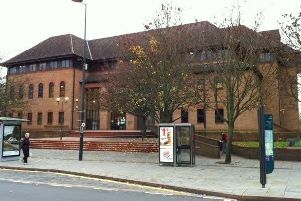 Chesterfield magistrates’ court heard on February 25 how Scott Eccles, 39, of Devonshire Terrace, Holmewood, Chesterfield, breached the order by contacting his former partner by letter, text, WhatsApp and Facebook. Solicitor Katie Buckley, who represented Derbyshire Constabulary, explained the order had been imposed as part of a civil procedure and not as a criminal procedure for Eccles not to contact, threaten or pester his former partner. She said the order was made on February 12 but Eccles’s partner received a letter from him apologising for assaulting her and blaming alcohol. Ms Buckley added: “She said she felt sick and unnerved by it. She said he has always done things he wants and he has no regard for authority. The following Monday Eccles also texted their daughter and asked her to tell her mother something and on February 16 there were four more Facebook messages and he said had assaulted his ex because she had provoked him. She added that there were also a series of other Facebook messages including expressions of love and rude comments. Eccles admitted breaching the domestic violence protection order between February 12 and February 21. Defence solicitor Kevin Tomlinson said Eccles accepts he breached the domestic violence order and he had spent a night in a police cell after the breach. Magistrates fined Eccles £200 and ordered him to pay £201 costs.